2011 did not start well for Japan. An M9.0 earthquake off the shores of Tohoku in March had unleashed a tsunami that inundated several hundred miles of coastline to a depth of nearly 40m in places. The Fukushima Daiichi nuclear plant started it's slow progress to meltdown and Tokyo held its breath as we braced for a city wide evacuation instruction. Japan had taken a heavy blow, down though not quite out. In the immediate months after the catastrophe the country needed a lift to bring it back to its feet. And in the early hours of 18 July a hand reached down and pulled for all its might. The Women's World Cup Final was being held in Germany. A night game local time, we sat down to watch in a sports bar in the back streets of Shibuya, central Tokyo at something around 3.00am. 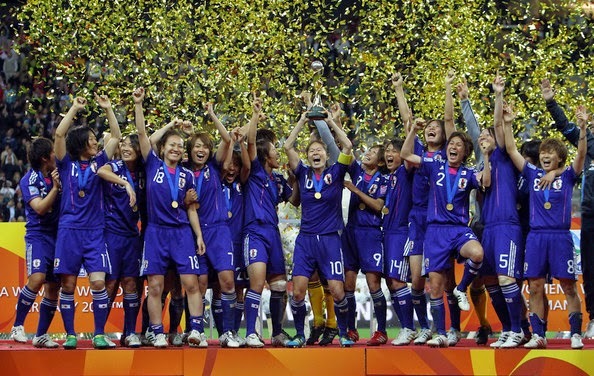 Let's face it, women's soccer doesn't have the greatest following in the world but this was different. This wasn't women's soccer, this was a country showing to the world it wasn't giving up. USA, a great team, were the favourites but Japan stood it's ground that night and at the end of extra time the score was 2:2. And the Championship would be decided on the next ten shots. The teams lined up for the penalties and I remember the bar becoming deathly silent. Even the staff and a local TV camera crew stopped and held their breath. And when the winning penalty found home we could hear the entire country erupt outside. When we finally emerged from our cellar bar, the last revellers were still celebrating at Hachiko Crossing. Japan had grabbed the hand and it had pulled it back to its feet. And in three weeks from now the team will have the chance to defend the World Cup title. But little will ever equal that moment when a country forgot its setbacks and was kickstarted back to life. Canada 2015 - Go Japan!